This is the week of big gatherings of family and friends and a time for outdoor excursions together. Daily joggers and walkers will be sharing local pathways with larger assemblages of folks. The wealth of trails and greenways offering us access to the natural areas of our community is worthy of our thanks. Chapel Hill’s most recent addition to its greenways, the Morgan Creek Trail: Merritt Pasture Access, is most definitely appreciated. Dozens of folks, from grandparents with baby strollers to dog-walkers and joggers, were making good use of this newest pathway this past Saturday afternoon. This Thanksgiving Day, I suspect it will be discovered by many. From the parking area, located just east of Kingswood Apartments along the N.C. 54 bypass, one may explore west on the unpaved sewer easement along the creek toward Frank Porter Graham Elementary School, or enjoy the newly paved portion as it travels east. The paved pathway to the east meanders through the forest and across the utility easement, providing close-up experiences with beautiful winter stems and seed heads of wildflowers and grasses. Generally, walkers seem more intently engaged with their dogs or conversations with companions than in observing the nature about them; last Saturday, however, one couple was eager to inquire about the fluffy clematis seed heads that had caught my attention. In fact, between the parking area and the elevated wooden walkway approaching the James Taylor Bridge, there are two species of native clematis sporting quite different seed heads. For walkers interested in subtle discoveries along the way, there is much to reward observant eyes. My special discovery of the day was along the southern edge of the pathway a short distance before the gentle ascent onto the elevated wooden walkway. 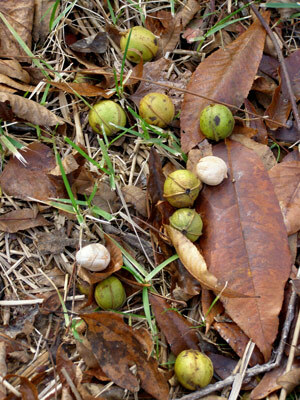 There in the leaf litter were numerous recently fallen fruit of a pale hickory, Carya pallida. Those shiny little hickory nuts are described as tasty; I’ll make an effort during this holiday to laboriously extract some meat from those smallish half-inch nuts to determine how tasty they may be. Continuing on beneath the James Taylor Bridge, the path is sited close enough to Morgan Creek to provide nice views and a glimpse into the distant past where the stone foundation of an earlier bridge silently rests, almost hidden within the forest. What stories that old stone foundation must contain. 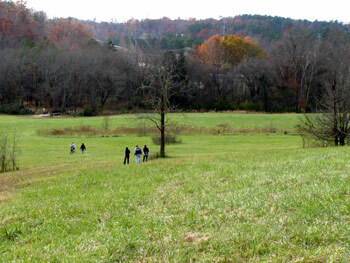 The paved path ends at the bottom of the extensive rolling former farm pasture of the longtime-resident Merritt family. To many, particularly the kids, this becomes the highlight of the greenway. The Town of Chapel Hill now manages the open pastureland to preserve several large populations of milkweed for butterfly habitat, with wildflowers and native grasses. For the winter season, most of the rolling hillside is open for kite flying and other pleasures so special to the kids. Whether or not you explore this new greenway with special folks this week, wherever you choose to engage nature, remember to pause in thankfulness for all the trails through the nature around us.